Over the past of couple of years, there has been a rise in number of health-conscious customers around the globe. They look out for ways in adopting a healthy and an active lifestyle, which has fueled the demand for health-oriented food products. Thus, protein supplement endures the same kind of traction in North America, Europe as well as Asia-Pacific regions. Healthy lifestyle is becoming a normal way of life that majorly has concerns over obesity, food sensitivity, and people affected by diseases continue to rise. Consumer expenditure on various protein and related supplements including ready to drink protein-based pediatric milk formulations has been increasing in the past few years owing to rise in disposable income and improvement in financial stability. People are expected to spend on these products owing to rise in health care awareness, obesity concerns, and ability to spend on various items such as protein bars and other supplements. In Asia-Pacific countries such as India, the GDP growth increased from 7.2% in 2014 to 7.6% in 2016. Due to increase in living standards and rise in willingness to spend money are some of the factors contributing to the growth of the protein supplement industry. The demand for protein supplements from the young population is increasing mainly in athletes as they provide various benefits such as lowering cholesterol, building of muscles, increasing strength, fighting cancer, improving immunity, and lowering blood pressure. Thus, this one critical factor provide positive impact on protein supplement market forecast. 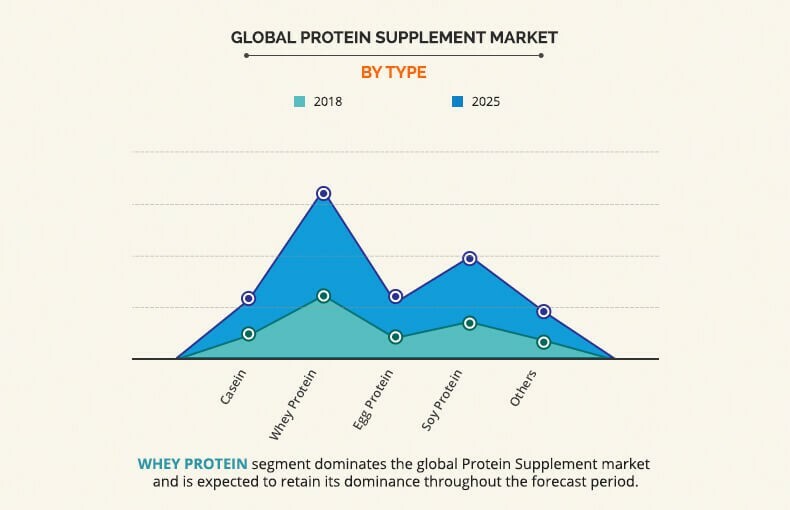 Based on type, the protein supplement market growth is studied across potential sources used to produce protein supplement products such as casein, whey, egg, soy, and other segments that includes pea, wheat, rice, canola, gelatin, collagen, and others. Among the product types, the whey protein segment accounts to higher protein supplement market share. Whey is the liquid byproduct that remains after the curdling of milk. Whey protein is a rich source of branched amino acids. There are two main types of whey protein i.e. whey protein concentrates and whey protein isolate. Whey protein is traditionally being used among athletes and bodybuilders since it promotes overall body growth and muscle building. Surge in demand for sports nutrition products and its value-added tag as clean label ingredients are the two main factors that contribute to the overall growth of the market. Based on age group, the protein supplement market size is studied across millennials, generation X, and baby boomers. Among the age group segment, the millennials are expected to account for higher share in terms of consumption for the protein supplement market. Millennials are known to be favorite customers for various protein and other supplement products. Most of the millennials adopt a healthy lifestyle to feel and look good. They indulge in various health-oriented extra-curricular activities such as hitting the gym and participating in various sports. Similar to other demographic groups, millennials are concerned about brain health, heart health, weight loss, weight maintenance, fighting fatigue, and maintaining high energy levels. This concern drives the demand for health promoting products such as probiotics, multivitamins tablets, fish oils as well as protein supplements. 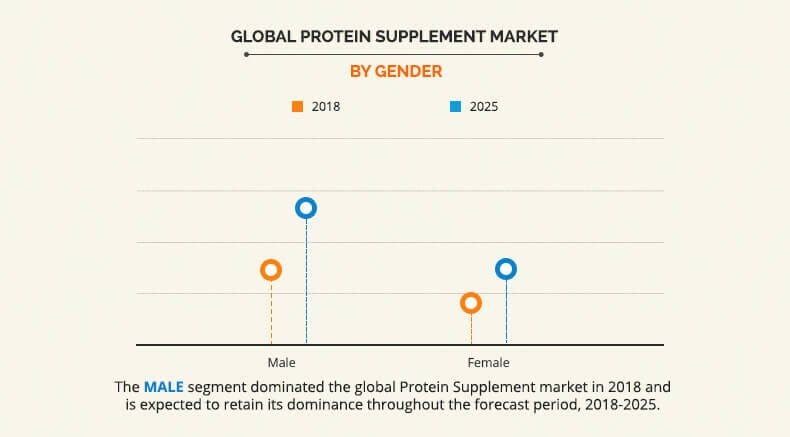 Based on gender, the protein supplement market is studied across male and female segment. Among the two demographic segment, the male segment is expected to have higher traction as compared to female segment as the male population looks out for performance enhancement supplements for various physical activities whereas the female population has less preference for the same. The male segment is the performance driven group when it comes to health and nutrition. Men seek protein nutrition for enhancement of performance. The male segment strives for more power and energy to support their high intensity exercise or workout. As a result, men consider having both pre and post workout supplementation. Moreover, men are early adopters of new products with various benefits. Considering these factors, the male segment accounts for a higher share in the global protein supplement market. 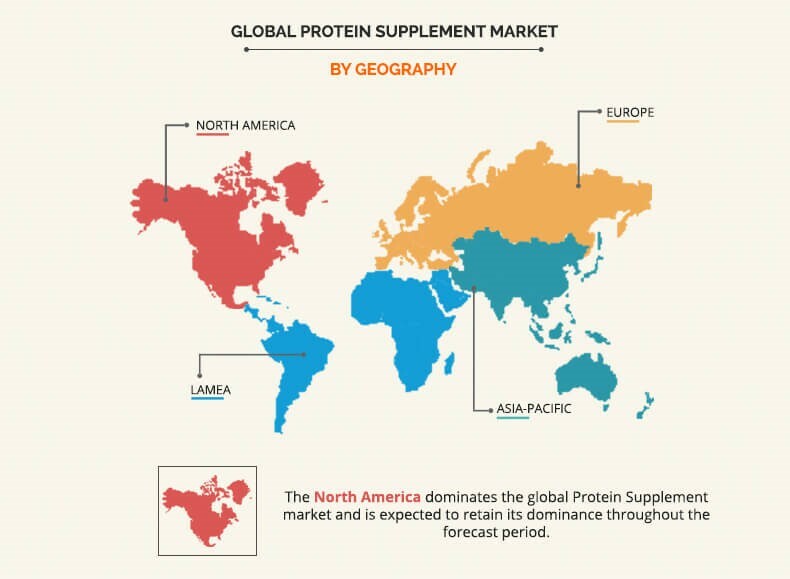 Based on region, the protein supplement market analysis is initiated across North America, Europe, Asia-Pacific, and LAMEA. Owing to the rise in number of health-conscious customers in most of the developed regions, North America accounts for higher share in the global protein supplement market. The U.S. health & fitness industry is expected to grow at a faster rate during the forecast period and shows no signs of slowing down. This is attributed to rise in number of the U.S. consumers adapting a healthy lifestyle or indulging in activities that promotes active and good health. Currently, about 20% of the American adults have fitness club membership and the numbers are expected to increase in the future. There is an increase in the demand for healthy food owing to the rise in number of health-conscious customers. Key players profiled for global protein supplement industry in the report include Abbott Laboratories, ABH Pharma Inc., Amway corporation, Glambia Plc., GlaxoSmithKline Plc, General Nutrition Corporation (GNC Holdings Inc.), Herbalife International of America, Inc., Maker Nutrition LLC, Suppleform, and Vitaco Health Limited. The report provides a quantitative analysis of the current protein supplement market trends, estimations, and dynamics of the market size from 2018 to 2025 to identify the prevailing market opportunities. In-depth analysis and the protein supplement market size and segmentation assists in determining the prevailing market opportunities. The report includes revenue generated from the sales of protein supplement products and protein supplement market revenue forecast across North America, Europe, Asia-Pacific, and LAMEA. The report includes the protein supplement market analysis at regional as well as the global level, key players, market segments, application areas, and growth strategies. 11.7. HERBALIFE INTERNATIONAL OF AMERICA, INC. 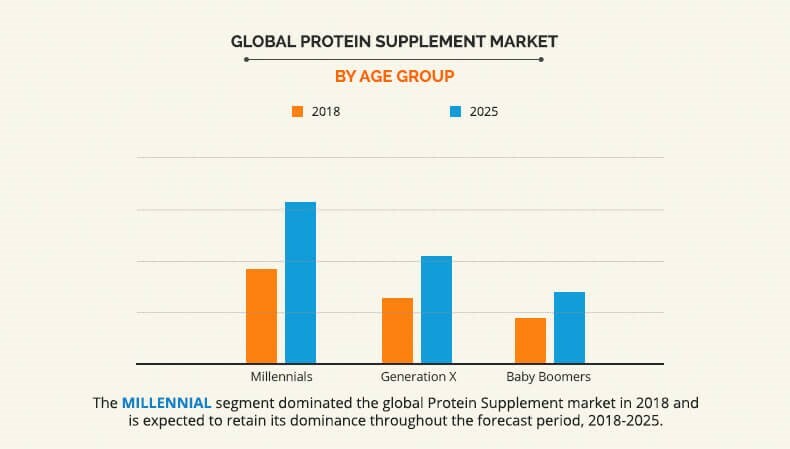 According to the CXO’s of the leading companies, the global protein supplement market is expected to witness significant growth during the forecast period owing to various factors such as increase in obesity rates, rise in healthcare awareness among youth, and surge in disposable income of consumers. Protein-related products used by athletes are included in the sports nutrition market, however, the ones taken by common people for building muscles or losing weight come under the global protein supplement market. These are generally available as protein powders in the market while RTD protein shakes and protein bars are comparatively new. By considering the all growth factors, the protein supplement market become a highly competitive market. The major player of this market are focusing on the research and development for their products which can fulfill the requirements of their target customers. Most of major players in this market are focusing on the improvement and promotion of their products. Among the demographic segment, millennials are being considered as the prime customers for the market.